This flag with a baton added is the banner of arms for the Duke of Grafton and the city of Grafton, NSW, Australia. These arms show the impaled coats of William and Mary, proclaimed king and queen in England in February 1689 and in Scotland in April 1689. They are identical, except that William bears an escutcheon of Nassau overall. 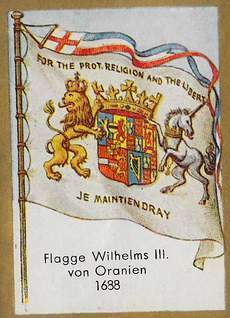 Personally, I have my doubts about the use of an abbreviation on a flag, as did Siegel (1912), possibly following S. de Vries, writing the word "religion" in full, but the tressure is depicted as a single tressure flory, so maybe this doesn't count. Curious point: Who made the "mistake" - the flagmaker or the flagpainter? William III of Orange-Nassau (1650 – 1702), as Willem III of Oranje Stadtholder of the General States (Republic of the Seven United Netherlands) since 1672, as William III King of England and Ireland since 1689, as William II King of Scotland. He was married with Mary II, daughter of Charles I of England from the Stuart kin. His arms are a nice example of complex quartering. They combine his personal arms (dexter half) with those of Queen Mary (sinister half), which are acc. to Neubecker the arms of the Stuart kings. The shield is divided per pale. The dexter half is quartered by the arms of Nassau (1) above right, of Katzenellnbogen (2) above left, of Vianden (3) below right and Diez (4) below left. In the honour point are the arms of Moers (5), in the heart point the quartered arms of Chalon(6 and 10) and Orange (7 and 9), superimposed in the centre by the arms of Geneve (8), in the navel point are the arms of Buren (11) in Gelderland (Netherlands). 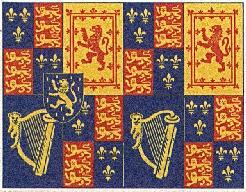 The sinister half is quartered by the counter quartered arms of England (12 and 15) and France ancient (13 and 14) above right, the arms of Scotland (16) above left, the arms of Ireland (17) below right and finally the quartered arms of England (18 and 21) and France ancient (19 and 20). (17): Ireland: in blue field a golden (= yellow) harp. It is a white flag. Shifted to the hoist are the arms of William III. The shield is topped by a golden coronet with fleur de lys and crosses patty. The shield is supporter by a golden (= yellow), rampant, guardant lion; crowned golden at the dexter side and a silver (= white), forcene, reguardant unicorn, wearing a golden (= yellow) coronet around his neck and a necklace (or chain) of the same colour hanging down from the coronet. 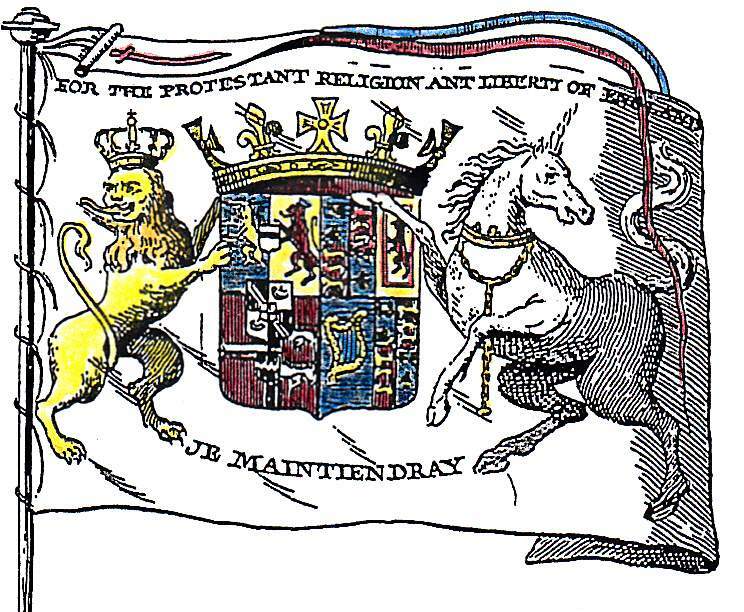 Above the whole ensemble is an inscription in black, serif initials “FOR THE PROTESTANT RELIGION ANT THE LIBERTY OF ENGLAND” and beneath the shield between the supporters feet another inscription of the same kind “JE MAINTIENDRAY”. The flag is topped by a swallow tailed blue over white over red streamer. The streamers white head is divided by a red St. George’s Cross. I think the phrase should read "I maintain" (as in uphold, will support and/or adhere to) the liberties of England etc. “Je maintiendrai” (modern spelling) is on the coat of arms of the Netherlands, and derives from an ancestor of William of Orange who vowed to maintain the independence of the Netherlands against the Spanish powers in the Middle Ages. The meaning is "I will maintain" or "I will persevere". 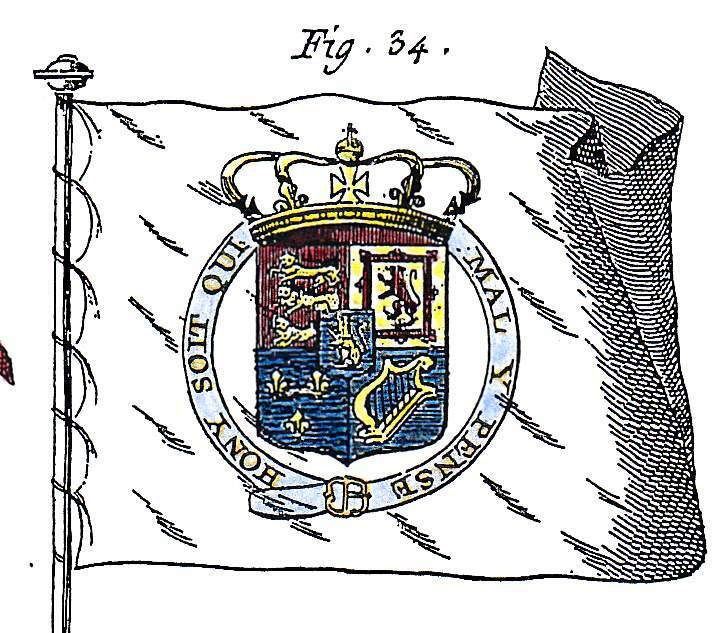 The flag is found with variations in several sources: Neubecker 1932, p.36, image 124; Diderot D’Alembert 1780; suite of plate 17, image no.32; Diderot D’Alembert 1780, edition 1780, plate 17 suite, image no.34. The last contains the arms as described above and is topped by a royal crown with four crosses patty and four fleur de lis and an imperial globe at the top, all in gold. The shield is surrounded by a blue collar, being the Order of the Garter held by a golden belt buckle and with the order’s motto around the belt in golden initials. The whole ensemble is shifted to the hoist. In the coloured 1751 edition the belt is red. The 1:2 proportions may not the best choice of ratio in this instance. Those proportions became usual for naval flags (due to the width of cloth used in making them) towards the end of the 18th Century, and I suggest that a flag of 1688 would be 11:18 at its longest and very possibly quite a bit shorter? I think you are right, but look at the source (Diderot)! The flag there has a sharp bend at the fly end without any design. For me it appeared even" longer". Thus 1:2 was my compromise between Diderot and Neubecker. 2:3 might however the better idea, because that's the ratio of Dutch flags, and William came to England as Stadtholder of the General States.